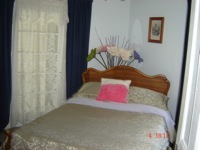 This room is furnished with a new comfortable queen size bed and includes an en suite bath with a shower. 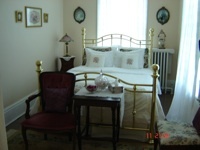 The accommodations will provide you the comfort and style you expect from a first class B&B. A furniture and decor mix from the past will take you back to the days when Victorian style was the talk of the town. This is the only room with two of the original leaded windows facing North. 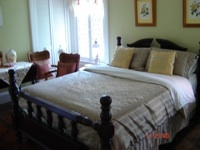 This suite includes a queen size bed and two windows sited on the North East corner of the house, again decorated with a Victorian flair. A large en suite bath with a Roman style bathtub will provide the guest with style and comfort. 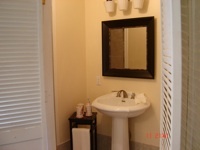 This room facing West, includes a double size bed and an in suit bath with a shower. Decorated to provide a sense of intimate relaxation in the quietest corner of the house. 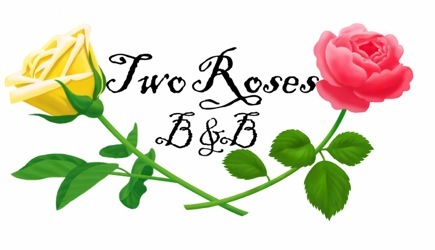 Like the other two rooms privacy and tranquility are part of your stay at the Two Roses B&B.